Welcome to the Beartown Banjo Gallery. Photos and information of all of my banjos are listed… all the way back to #001. Please feel free to peruse the banjo gallery and reach out to me if there is a banjo that you’d like to talk about. To see banjos currently available please click here to visit the banjo store. I am always working on new builds. The primary woods at Beartown are hard maple, cherry and black walnut from New York and Pennsylvania. Sapele mahogany, bubinga, purpleheart, and wenge are some of the more exotic (and more sustainable) woods utilized. Necks are laminated with 3 layers, and block rims are hand built and turned in house. The most common setup is 25.5″ scale length, 11″ block rim, 2 way truss rod adjustable at heel, 5th string tuner at 5th fret, custom Beartown curved bridge. If you are interested in a custom built banjo or would like to know about currently available instruments, please email (beartownbanjo@gmail.com) or call me 607-275-1674 to discuss options. This banjo has an 11″ block rim of curly Maple. Rim cap is Black Walnut, as is the upper rim layer, which supports brass Dobson style tone ring. 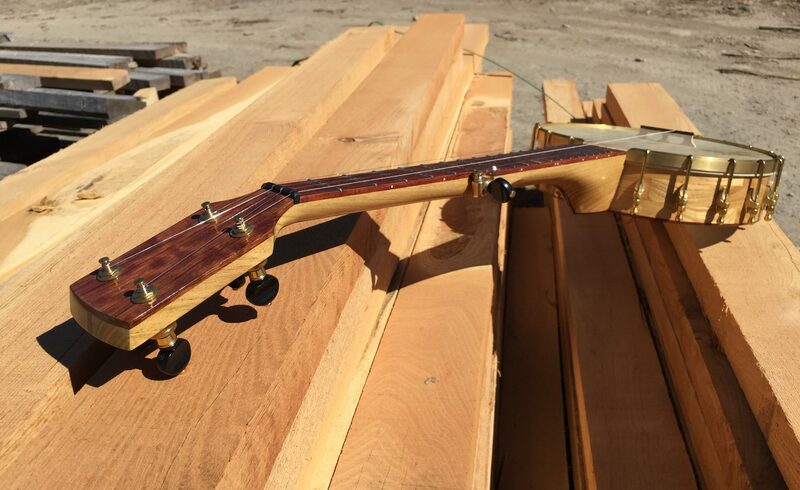 Neck is 3 piece laminate of black walnut with a dual action truss rod accessible at the heel. Fingerboard is oiled Jatoba. Headstock laminate (front and back) and heelcap are Jatoba (“Brazilian Cherry”) with a headstock inlay of curly maple and mother of pearl. Instrument is finished with a penetrating oil finish. Banjo is set up with brass hardware and brass Gotoh planetary tuners, curved Beartown bridge and Elite fiberskin head. Set up is with a modest frailing scoop level with the head. Scale is 25.5″ with 19 frets. 5th string nut is at the 5th fret. Tone is pure and ringing, with good sustain and clarity. Responsive in lower positions and up the neck. With a 25.5″ scale this banjo can easily be tuned to G/C or A/D. This Banjo is on display (and for sale) at Ithaca Guitar Works 215 North Cayuga Street, Ithaca, NY Stop in to take a look, and give it a play!! This banjo has an 11″ block rim of cherry. Rim cap is purpleheart, and the upper rim layer is black locust, which supports brass rod style tone ring. Neck is 3 piece laminate of cherry and purpleheart with a graphite fiber neck rod.Fingerboard is oiled purpleheart with EVO gold fretwire. Headstock and heel are black locust with a paduak laminate layer and headstock has a paduak and mother of pearl inlay. Instrument is finished with a penetrating oil finish. Banjo is set up with brass hardware and brass Gotoh planetary tuners, curved Beartown bridge and Elite fiberskin head. Brass Hardware: 18 brackets, double-pointed shoes, grooved tension hoop, bacon style nuts, Pigsah Hawk tailpiece, Gotoh tuners. Trim: Heel cap and headstock of black locust with paduak laminate. This banjo has a block rim of curly Maple. Rim cap is Black Walnut, as is the upper rim layer, which supports a 1/4″ brass rod tone ring. Neck is 3 piece laminate of black walnut with Black Locust midrib. 1/8″ x 3/8″ carbon fiber reinforcement assures stiffness and stability. Fingerboard is oiled Padauk. Headstock laminate and heelcap are figured Black Walnut with a thin Padauk veneer and a headstock inlay of black locust and mother of pearl. Instrument is finished with a penetrating oil finish. Please note that this banjo has been “played in” and fine tuned by me for a few weeks and may show signs of gentle use. There has been no up-charge for the goatskin head, and this may be substituted with a fibre-skin or renaissance head if you would like. This banjo is living a new life in Australia with it’s new owner, but I can build another for you! This banjo is the grown up cousin to Banjo <a href=”http://beartownbanjo.com/wp/product/banjo-004-cherry-purpleheart/”>#004 of Cherry and Pupleheart</a>, with the addition of a brass Dobson style tone ring. This banjo has a block rim of cherry. Rim cap is purpleheart, as is the upper rim layer, which supports the Dobson style tone ring. Neck is 3 piece laminate of cherry with mid-rib of purpleheart. 1/8″ x 3/8″ carbon fiber reinforcement assures stiffness and stability. Fingerboard is oiled purpleheart. Headstock laminate and heelcap are also purpleheart. Instrument is finished with nitrocellulose lacquer. Banjo is set up with brass hardware and brass Gotoh planetary tuners. Currently set up with a elite fibreskin. Set up is with a modest frailing scoop level with the head. Scale is 25″ with 17 frets. 5th string nut is at the 7th fret. Bridge is custom Beartown 11/16″ curved bridge. With a 25″ scale this banjo can easily be tuned to G/C or A/D. I often keep this one in G/C where it has a particularly sweet and mellow tone. Block rim of sapele. Rim cap is Cherry, as is the upper rim layer, which supports a 1/4 brass rod tone ring. Neck is 3 piece laminate of cherry with center rib of sapele. 1/8″ x 3/8″ carbon fiber reinforcement assures stiffness and stability. Scale is 25.5 and side peg is at the 7th fret. Fingerboard is oiled wenge. Banjo is finished with waterborne lacquer. Banjo is set up with brass hardware and brass Gotoh planetary tuners. Currently set up with a goatskin head and 11/16 Beartown curved bridge. Sound is somewhere between booming and ethereal with the 12″ pot, goat head and extra low string tuned 2 octaves below the 5th string. Includes 12″ pot hard shell case. This banjo has a block rim of hard maple. Rim cap is black walnut, as is the upper rim layer, which supports a brass Dobson style tone ring. Neck is 3 piece laminate black walnut. 1/8″ x 3/8″ carbon fiber reinforcement assures stiffness and stability. Fingerboard is oiled wenge. Headstock laminate and heelcap are also wenge. Instrument is finished with waterborne lacquer. Set up is with a modest frailing scoop level with the head. Scale is 25″ with 17 frets. Bridge is custom Beartown 11/16″ curved bridge. This is an early photo gallery early after banjo was finished. This Banjo is SOLD and living its life in Ithaca, NY with its new owner. This banjo was my favorite player for a year or so before it went on to its next owner. Here’s a more recent shoot with skin head and many hours of love. This banjo has a block rim of sapele. Rim cap is hard maple, as is the upper rim layer, which supports a 1/4 brass rod tone ring. Neck is 3 piece laminate of sapele with center rib of hard maple. 1/8″ x 3/8″ carbon fiber reinforcement assures stiffness and stability. Fingerboard is oiled wenge. Headstock laminate and heelcap are also wenge. Banjo is finished with nitrocellulose laquer. Banjo is set up with brass hardware and brass Gotoh planetary tuners. Initially set up and photographed with an “Elite” fibreskin head. Since fitted with a Remo Renaissance head, offering more precision and clarity in tone. Set up is with a slightly deepened frailing scoop level with the head. This raises the finger board slightly relative to the strings to provide lower action, while maintaining a more traditional frailing setup with nice clearance between strings and head. Bridge is custom Beartown 3/4″ curved bridge. Sound is comfortingly plunky with bell tone clarity up the neck and good sustain. Responsive in lower positions and up the neck. This banjo is a sweet instrument all around. Block rim is made up of two full layers of cherry with a thickened rim cap and tapered tone ring layer of purpleheart. The neck is s three layer laminate of cherry with a purpleheart rib. Neck reinforcement is 1/8 x 3/8 graphite fiber epoxied in place. Cherry is one of the less dense woods that we use, so this banjo is comfortably light and warm sounding. The purpleheart tone ring provides clarity and definition to the tone. Set up with moderate frailing scoop to the 15th fret, fiberskin head, nickle plated brass hardware and nickle plated Gotoh tuners. Fingerboard is oiled purpleheart with a beautiful whorled figure and headstock and heelcap are pupleheart as well. This banjo is a joy to play, and sounds beautiful. This Banjo is SOLD and is living its life in Missouri with its new owner.